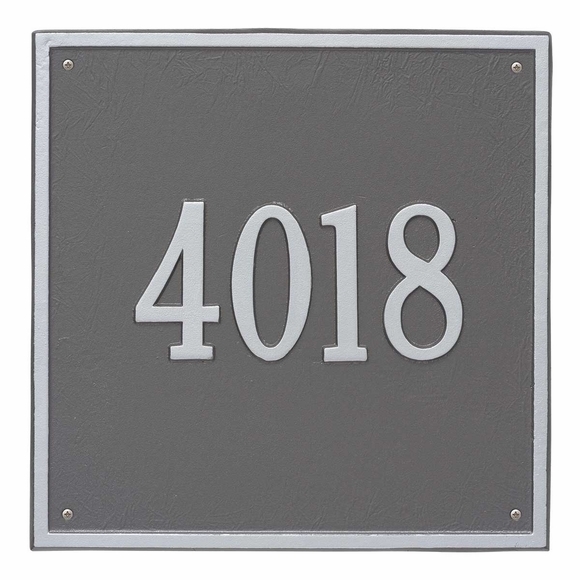 Large House Number Plaque with up to three 7" Numbers - - 15" x 15" square metal sign. Wall mount or porch mount. Made in USA. Colors (from left to right in small images): AB antique brass; AC antique copper; BG black with gold characters; BS black with silver characters; BW black with white characters; OB oil rubbed bronze; OG bronze with gold characters; PS pewter with silver characters; RG red with gold characters; WG white with gold characters; and GG green with gold characters. or up to twelve (12) 2" characters. Border accentuates the square shape and matches character color. Dimensions: 15"W x 15"H x 0.375. House number shown above: 4018.